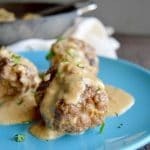 Authentic Swedish Meatballs (IKEA copycat) can be ready to serve in 30 minutes which makes them perfect for last minute meals! Served in a creamy gravy, you only need pantry ingredients and ground beef to make them! Mix in a bowl: ground beef, onions and 3/4 teaspoon of ground nutmeg salt and pepper. In a sesperate bowl, crack egg and place in bowl sans shell. Using a fork, beat egg well until all combined. Add egg to meat mixture, mix egg well into all parts of meat. (Egg acts as a binder so your meatball won't crumble when cooking) Make small balls about 56 grams a piece. (you should get 12-13 meatballs when done. Heat a skillet or dutch oven that you have a lid for to high, Brown all sides of meatballs leaving enough room in between to flip them so that all sides are nice and browned. About 5 minutes. Remove meatballs from pan, place on separate plate. (Meatballs will not be cooked thru at this point.). Reduce heat to medium high. This recipes calorie information was obtained by using the ingredients I purchased specifically using My Fitness Pal. If you are following a strict diet, please know that substituting ingredients, brands etc will alter the caloric information and plan accordingly.